If you use Google Maps on your phone to navigate, you’ve probably noticed that it has been limited to navigating from your current location to one destination. That is normally enough, but there are some times that you want to take a little detour somewhere in the middle. In the past, you needed to cancel your current route and start over with getting instructions for the detour. The latest update changes that. While you’re navigating, you now see a magnifying glass – the icon for Search – in the upper right side of the Google Maps screen. 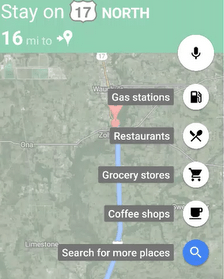 Tap that icon and you’ll see several options: gas stations, Restaurants, Grocery stores, and Coffee shops. 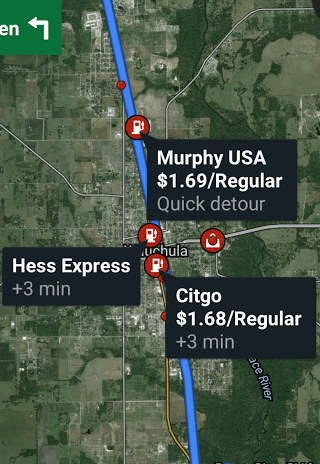 If you choose gas stations, you will see the stations along your route. You will also see the latest price for gas attached to each station. I don’t see how to get Diesel prices, so I’ll be keeping Gas Buddy for a while. If you want to stop at one of those stations, just tap it and you will see an icon at the bottom to Add Stop. If you’re not looking for something in those categories, you can click the “Search for more places” to get Google’s normal search screen. Search for whatever you want, then tap a location in the search results to Add Stop. You can’t save the route you just created on the phone, but if you create a route on the computer, there is a way. Send yourself an email and paste the URL link into it. When you open that email on your phone and tap the URL link, you can open up Google maps and use Navigation for the entire route. Geeks on Tour members can watch these videos to see exactly what I mean. To enjoy full access to the Geeks On Tour Library of “How To” Videos on Google Maps and other topics sign-up for a membership today! Published by MrsGeek, in Blog. Tagged with #GeeksWhoTeach, Android, Droid, Gas Buddy, Geeks on Tour, Google Maps, Google Navigation, iPad, iPhone, Smartphones, Tutorial Video.